Last year, Hard Case Crime released the eight novels Michael Crichton wrote between 1966 and 1972 under the pen name John Lange. As a huge admirer of Crichton’s work – Jurassic Park remains one of my favourite novels – I purchased them all immediately, no questions asked. 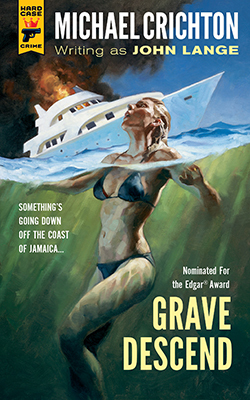 It wasn’t until recently that I finally dived into one: the 1970s-published and Edgar Award nominated Grave Descend. Diver James McGregor is an orthodox hard-boiled protagonist. Generally unlikeable, tough-as-nails, with a proclivity for trouble. In this instance, he is enlisted to explore the wreck of the Grave Descend and remove mysterious cargo. But things aren’t what they seem: almost immediately McGregor learns he’s being lied to, by more than one person. He’s being played – but to what end? With a pretty penny on the line, he accepts the job; and quickly finds himself hunted by the police, terrorized in hammerhead shark-infested waters, and betrayed by someone closest to him. Not much here reflects Crichton’s trademark research-infused narratives made famous in Jurassic Park, The Lost World, Congo, State of Fear, and so forth. Grave Descend is very much a crime novel, the prose stripped, and raw, and punchy: it clocks in at less than two hundred pages. It’s deliciously readable, however; reminiscent of those 80’s television shows, where you’ve got your main character who is presented with a situation and spends the next hour solving it, ready to start again next week, same time, same channel. McGregor doesn’t return again, but he very easily could. Simple but effective, and darn entertaining, Grave Descend is an interesting glimpse into Crichton’s early career, and a satisfactory interlude between tomes (Murakami’s 1Q84 is next on list). Special mention to Gregory Manchess for the striking cover, too; I wish painted illustrations featured more often.